It's like having a toolbelt for your handbag The PortaPockets Purse Insert can be made small or large and is designed to be lifted from one bag and dropped into another. 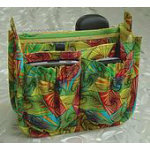 Now you can change bags every day if you want to, yet always have your things organized and at hand. Provides storage for your cell phone, glasses, checkbook, PDA, keys, makeup, credit cards, and more The large size option includes 3 extra slots for credit cards, and an extra interior elasticized pocket. There are even exterior elasticized pockets for more storage Finished sizes: Small 6" tall x 8" wide x 2.5" deep. Large 6" tall x 10" wide x 2.5" deep. c2007 StudioKat Designs.